We care about the safety and reliability of our products. All products are accompanied by a full package of documents, including safety certificates and declarations of compliance with GOST R for commercial inflatable attractions. The company "AEROMIR" is pleased to offer you inflatable figures to order, aeromen, inflatable arches, scenes and hangars, inflatable advertising, winter, water and team rides, as well as inflatable trampolines and obstacle courses. In accordance with the current legislation of the Russian Federation, all inflatable commercial attractions are subject to declaration, the rest of our products undergo voluntary certification. 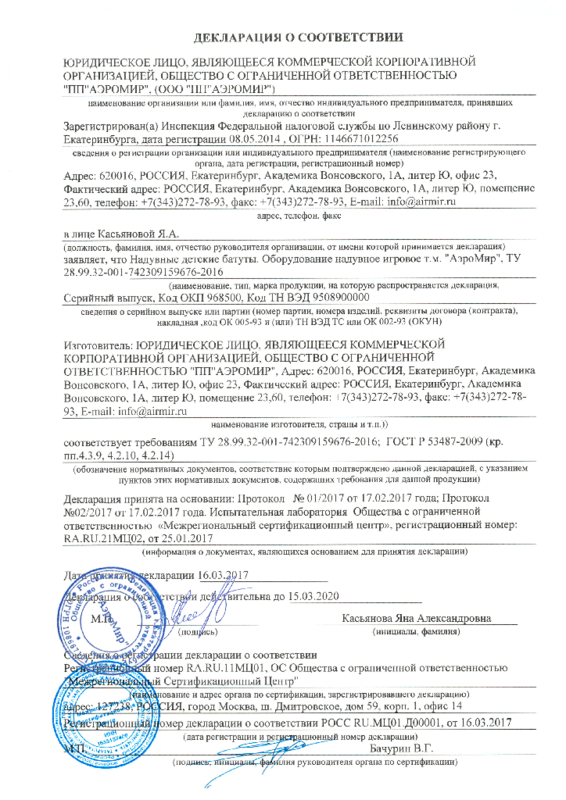 We were the first in Russia to receive a declaration of conformity №ROSS RU.MTS01.D00001 and ensure the availability of a full package of documents confirming the quality of the product. It is primarily about inflatable slides and inflatable trampolines for business. Today, when issuing permits for their installation and operation, regulatory authorities pay special attention to the safety of players, and therefore always require a document confirming the quality of inflatable attractions. When buying a trampoline elsewhere, make sure that the product is safe - by having a declaration of conformity! Being a responsible and customer-oriented manufacturer, we take into account your needs. Our company regularly on a voluntary basis undergoes certification and certification procedures. For example, inflatable trampolines and obstacle lanes “AEROMIRA” are certified for compliance with GOST R 53487-2009 "Amusement safety. Gaming inflatable equipment. Safety requirements. Test methods". This standard is the fundamental regulatory document for this type of product. In addition, all our products are manufactured according to technical conditions (TU), strictly complying with the standards of GOST R. And the material from which the rides and trampolines are made, complies with the Uniform sanitary-epidemiological and hygienic requirements for goods subject to sanitary-epidemiological supervision. This is confirmed by an expert opinion. Obtaining each such document is a difficult and expensive undertaking. But it's worth it, because the main result is not just a “paper”, but your confidence and the safety of your small and large clients.